We’ve been aboard Azamara Journey only a couple of hours but already we’ve been welcomed with a glass of champagne, settled in on the pool deck for a late lunch accompanied by a couple of beers, and watched a performance of Maori and Polynesian dance and song before tucking into a seafood buffet dinner. It could just be the drinks talking but it’s really no wonder my boyfriend Davey has already announced he’s “completely sold on cruising”. Granted, almost all of the other guests have a good few decades on us. But we might chalk that up to the wisdom of maturity — because, despite having very little cruise-ship experience between us, we’re already finding plenty to recommend life at sea. There’s the ship, for starters. Launched in 2007 and having arrived in Auckland fresh from its maiden visit to Australia, Journey is part of Azamara Club Cruises’ two-ship fleet. The up-market Royal Caribbean-owned brand is known for its boutique feel and luxurious touches, a measure of which might be that when I admire a picture in one of the bar areas, a closer look reveals it to be a signed and numbered Roy Lichtenstein print. Carrying 690 passengers and 408 staff and crew, the ship’s considered mid-sized but feels pleasantly small compared with some of today’s vessels. Smaller ships such as this are often touted for their ability to visit ports that bigger ones can’t but equally welcome is the fact we rarely encounter a queue or a crowd aboard throughout our journey. Unlike passengers on some larger ships, we have no trouble getting a booking for the specialty restaurants and never have to wait more than a few minutes to disembark in port. The majority of Journey’s staterooms have a balcony and there are distinctly ritzy options, including the Club Spa Suites, one of the new features added last year during an extensive refurbishment. Near the Sanctum Spa, these suites come with perks including spa credit and access to Nights in Private Places, a pampering experience that includes sleeping under the stars on the private Sanctum Terrace. We’re in a Club Oceanview stateroom that, at 16sqm, feels cosy but not poky, with plenty of storage to keep things neat and tidy. Our room quickly becomes our sanctuary aboard, with its very comfortable queen-sized bed by the window, flat-screen TV on the wall, armchair and coffee table, desk and chair, and compact bathroom. There are nice touches throughout: proper hangers in the wardrobe alongside the bathrobes and slippers, plus a tote bag, umbrella and binoculars for us to use. Our friendly cabin attendant Anwar rarely services the room without leaving a small treat: fresh flowers, say, or something sweet at bedtime. The rest of the crew are similarly warm and helpful, and happy to chat about where they’re from and their lives aboard the ship. A particular stand-out is the good-humoured but impeccably professional service at steakhouse Prime C, one of two specialty restaurants side-by-side at the ship’s stern (the other, Aqualina, is Italian; both have a $US30 ($39) per person cover charge but are free for suite passengers). With an ocean view through the full- length windows to accompany four delicious courses, our dinner at Prime C is also the best meal we have aboard — which is saying something, given we eat well everywhere, from burgers at the poolside Patio to the buffet in Windows Cafe and dinner in the main dining room, Discoveries Restaurant. All of this is still ahead of us, though. For now, we’re setting sail from Auckland through the calm, silvery waters of Waitemata Harbour. Cruising in and out of port ends up being one of my favourite parts of the journey, and this evening’s departure — timed for sunset — has a real sense of occasion. We stay on deck until it’s dark, watching as the lights of the city recede against the velvety sky. We wake the next morning to low, grey clouds tinged pink by the sunrise. We’re in the Bay of Islands, and though rain is forecast, we’re keen to get ashore. Excursions are offered at an additional cost and options today include a boat trip to well-known landmark the Hole in the Rock, a lunch cruise on the bay and tours of some of the area’s historic towns. We’ve opted to visit the Kawiti glow- worm caves and the Puketi State Forest, where our pleasingly enthusiastic guide introduces us to some hulking kauris, an endemic tree species that’s among the largest and longest-lived in the world. The crew snap into action to mitigate the effects of the bad weather. Housekeeping attends to those balcony stateroom guests who have damp carpets as a result of water ingress. Open decks are closed due to the high winds. The medical station dispenses anti- seasickness medicine (neither of us is affected). And, to keep us all occupied, an eclectic array of activities is added, from trivia competitions and dance and art classes to a special lunch for solo travellers, a movie screening and a talk from cruise director Tony Markey about being aboard cruise ship Seabourn Spirit when it was attacked by pirates off Somalia in 2005 (no guests were injured, and the ship has since left the Seabourn fleet). I opt for a hot-stone massage in the spa, and consider a visit to the fitness centre before remembering I’ve conveniently forgotten my running shoes. After lunch we take up residence in the Living Room, one of the new additions from the 2016 refit. At the bow of the ship, it’s open 24 hours for drinks and snacks, cards and board games, activities from quizzes to putting contests, or just relaxing in an armchair. The atmosphere is so laid-back I spot one guest reclining on a couch with her shoes off and feet up, and it’s soon a favourite spot — and not just for the scones with jam and cream served in the afternoons. In all, the day feels like an excellent excuse to do a lot of very little. We spend the whole afternoon in the Living Room, reading and watching through the floor-to-ceiling windows as seabirds surf low over the deep-blue ocean. Beyond, the North Island slips past in a bluish haze, just a few lonely buildings studding the coast. Just before we round East Cape — the easternmost point of New Zealand’s main islands — I glance up to see dozens of dolphins alongside the ship. It’s a genuinely magical moment and watching them leap and dive along the starboard side banishes any residual regret at being confined to the ship. Another benefit of our unexpected sea day is an earlier arrival at our next port, Napier. This gives us a full day to look around the town, which is known for its concentration of Art Deco architecture, built after a devastating earthquake wiped out much of its centre in 1931. We explore independently, catching the shuttle bus from the port to join a walking tour run by the Napier Art Deco Trust, before lunch and some shopping. Others head off on organised excursions including tastings at local wineries, a guided bike tour and a visit to a sheep farm (we’re in New Zealand, after all). We’re greeted by sunny skies and warm weather in Wellington the next day. It’s nearly the end of the line for us — but not quite, as the ship’s docked overnight. (Longer port visits, including overnight and late-night stays, are a point of pride for Azamara.) As usual, there’s a range of excursions on offer but we disembark on our own to look around the city and visit Zealandia, the pioneering eco-sanctuary a short ride away. 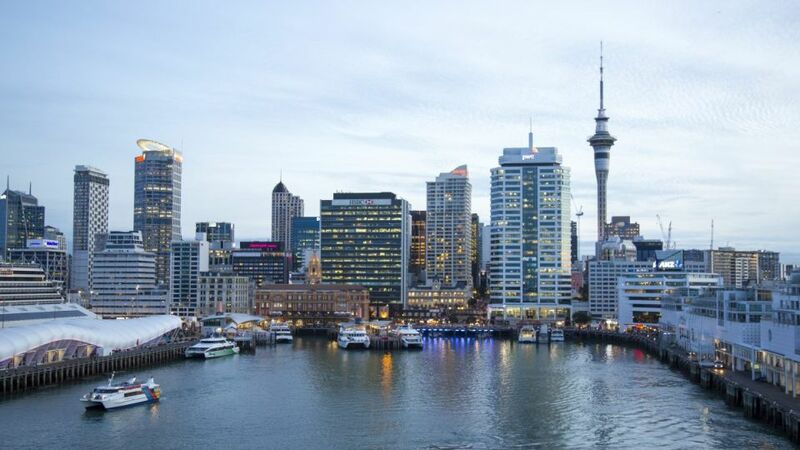 Later, we head to Te Papa Tongarewa, the renowned national museum on Wellington’s foreshore, for an event known as an AzAmazing Evening — an Azamara signature included free on most voyages that aims to deepen passengers’ experience of a place. Ours provides an insight into Maori culture through dance and song, from welcome songs by performers in traditional costume to tunes inspired by Maori show bands of the 1950s and 60s. Especially memorable is the MC, the actor Temuera Morrison (from the Star Wars prequels and Disney’s Moana), encouraging the men in the audience to join in a simplified haka. After, there’s a chance to see some of the museum’s exhibitions. The next evening, Journey will continue on around the South Island before crossing the Tasman Sea to Hobart and Sydney. It’s also set to return to Australia in January, when it will cruise the WA coast ahead of Azamara’s first World Journey, a 102-night cruise from Sydney to London from March via 60 ports in 29 countries. But for now, back on board, we settle in for our last night on the water. Among the inclusions on Azamara cruises are selected spirits, international beers and wines, gratuities, bottled water, soft drinks, coffee and tea, self-service laundry and, on most voyages, an AzAmazing Evenings event. Journey will offer four local cruises during its 2018 Australian season, including a new 18-night Australian Explorer Voyage from Bali to Sydney via Exmouth, Fremantle, Bunbury, Albany, Esperance, Kangaroo Island, Adelaide and Melbourne. It costs from about $7542 per person, twin share for a Club Interior stateroom, including taxes, fees and port expenses. Sectors on Azamara Journey’s 102-night World Journey include an 18-night Australia to Asia Voyage, departing Sydney on March 7, a nine-night Tapas, Wine and Golf itinerary from Barcelona to Lisbon and a 10-night Normandy and Amsterdam voyage. Other upcoming voyages aboard Journey include a 13-night British Open Voyage from July 19, and a seven-night History of the Aegean cruise departing round trip from Athens on October 10. For more contact your travel agent, go to azamaraclubcruises.com or phone 1800 754 500. Gemma Nisbet was a guest of Azamara Club Cruises.